Coconut ice is a traditional school fete treat that always takes me back to my childhood. The type of coconut ice that we used to get was the boiled kind, which can be tricky to make - over-boil the mixture and it ends up dry and crumbly, and the layers won't stick to each other. Fast forward a few years, and I found a number of recipes for coconut ice that involve condensed milk and no boiling. This makes it easier to make, and the end result is pleasingly soft and moist. To make coconut ices for my Christmas boxes, I used this recipe based on condensed milk from Australian Women's Weekly Sweet. Of course, you don't have to limit your coconut ice making endeavours to Christmas - coconut ice can be enjoyed as a year round gift or treat. Do you make home made sweets? And what is your favourite home made sweet? 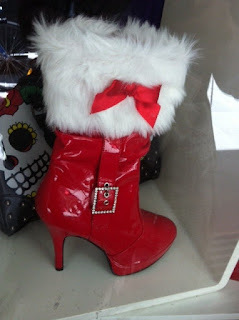 With Christmas having come and gone, we are now looking forward to New Year. If you are hosting a New Year's party, drinks and nibbles are often the order of the day. For a moorish snack for party goers, I always think that spiced nuts go down a treat. How spicy you make your nuts depends on your guests' tastes. If hot and spicy is your thing, I don't think you can go wrong with this recipe for spiced nuts. The honey adds a hint of sweetness and helps the spicy chilli powder and paprika to adhere to the nuts. Even better, these nuts are quick and simple to make. I used a mixture of brazil nuts and almonds, but I think almost any type of nut that takes your fancy would be good coated with this spice mixture. I packaged up my nuts for Christmas boxes, but do confess to sneaking a few myself along the way - they are pretty good. Welcome to the last FFwD recipe for this year. This week's French Friday with Dorie recipe is Go-with-everything Celery Root Puree. In Australia, celery root is sold as celeriac, and is a strange looking beast that I have never purchased before. It is hard, brown and nobbly on the outside and is quite hard in the middle too, making it a challenge to peel. Peeling it is somewhat like peeling a pineapple, as you slice off the skin in chunks rather than thin strips. I only made a half recipe of this puree, and I am glad about that - the celery taste was rather overwhelming, despite the presence of potato and several other ingredients, so unless you like celery, I wouldn't recommend trying this dish. I served it as a side with a beef stir fry with lots of sauce for the puree to soak up. To see what the other Dorie cooks, thought, visit the LYL section of the website. And I was glad I did. Don't get me wrong - making this panettone is a whole day job, not with constant attention, but certainly with time for the 5-6 hours worth of rising time required over three different rises. However, the end result is a fluffy, tasty panettone that puts the commercial ones in the shade. Instead of candied orange peel, I used cranberries for colour - not traditional perhaps, but visually and taste-wise, a good move. I almost came to grief when cooling my panettone. Marcellina's recipe suggests that you should demould the panettone from the tin (I used a souffle mould) and cushion it on towels on its side to cool. This was a bad move - the panettone cracked under its own weight where it rested on the bench, so I hastily righted it and let it cool in the usual way. I liked this yeasted bread-cake hybrid, and Tim was the recipient of a generous piece for his family. To see what the other Daring Bakers made of this recipe, view the slide show on the Daring Bakers website. 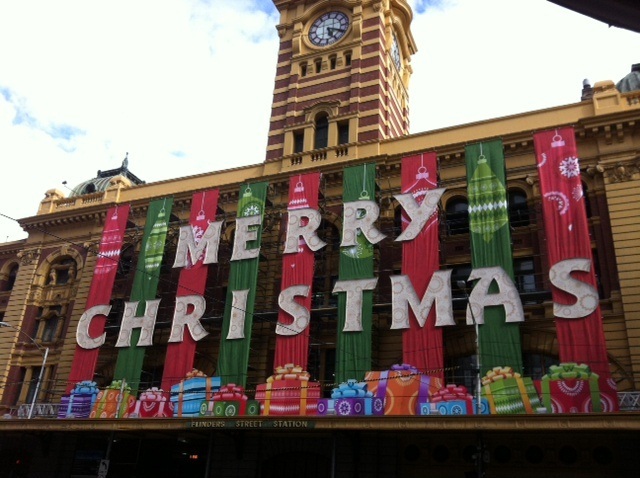 Hope you had a wonderful Christmas, and Happy New Year! Christmas has been and gone for another year, but a great idea for gifts for the sweet tooth all year round is home made fudge. For my Christmas boxes this year, I made the devine salted caramel fudge pictured in this post. The recipe can be found online here at Taste.com.au. This fudge is fairly easy so there is not much I can add to the recipe. However, do be careful not to let your fudge burn (eg by turning up the stove too high). The fudge will take a while to thicken, but be patient - it gets there eventually. If you end up with hard dark burnt bits in your fudge, you can sometimes salvage it by sieving the mixture - but this must be done before it gets too thick or sets. Otherwise, make this fudge, sit back, and enjoy its contrasting sweet and salty flavours as it melts in your mouth - but try to save some for gifting! Remember my Betty's of Harrogate fruit mince? Well, I put it to good use in my Christmas boxes this year by making fruit mince pies. To make my pies, I used Margaret Fulton's recipe for the pastry, from Margaret Fulton Christmas, and available online here. The pies are filled with two teaspoons of fruit mince. The fruit mince is quite rich, so that is quite enough. i was very happy with the pies - Margaret's pastry is a little more robust than the very short recipe I have used in the past, so it can be packaged easily, but still tastes buttery and good. Just gorgeous! Unfortunately, I don't get a piece, as I sliced it all up and gave it away in my Christmas boxes. One of the staple treats of Christmas in many countries is the spiced cookie. Accordingly, I felt that I had to have at least one type of spiced cookie in my Christmas boxes again this year. The natural choice for me was gingerbread. I decided to use Margaret Fulton's gingerbread men recipe from Margaret Fulton Christmas, which you can also find online here. However, instead of gingerbread men, I cut my gingerbread into discs that I could decorate. Inspired by my CW Cakes cupcake decorating course, I wanted to use the technique of stencilling fondant to decorate my gingerbread cookies. 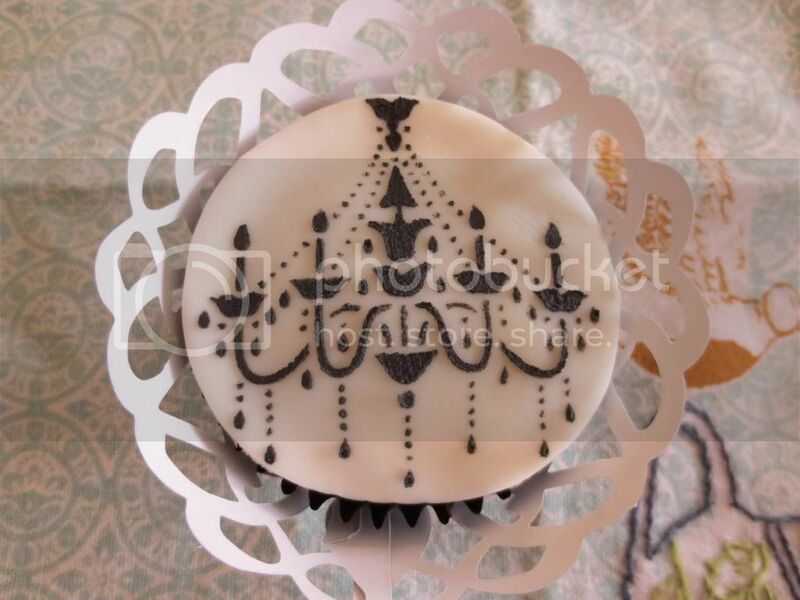 I bought these stencils and Bakels white and chocolate fondant, and made my own royal icing and made some of it very thick and slurry-like and tinted green, while I left the rest white and of a thinner consistency. To decorate the cookies, I rolled out pieces of fondant just large enough to cover a cookie. I then pressed the stencil down over the icing firmly, then using a thick paint brush, dabbed the green royal icing over the stencil. Using a straight edged pastry scraper, I removed the excess icing from the stencil. Next, I sprinkled gold edible disco glitter over the wet royal icing by tapping a glitter laden brush over the top of the icing, then carefully lifted the stencil. I then let the icing set a little. I used the same cookie cutter that I used to make the cookies to cut out rounds of stencilled fondant. Using a spatula, I spread the thinner white royal icing onto a cookie, then carefully placed the fondant disc over the icing and tamped down the edges carefully. Voila! I had some good feedback on these cookies, independently by two recipients, so I was pleased. These cookies were definitely the most fun thing to make out of this year's Christmas boxes, and they allowed me to show off my new stencilling skill. Tips: Scrape off as much icing as possible from the stencil between cookies, as the icing dries and clogs up the stencil. Keep your icing well covered (fondant and royal icing) to stop it from drying out. It's Christmas, and that means Chrismas box season. The second addition to my Christmas boxes was Bethmannchen, a traditional cookie from Frankfurt. It is named after a well known Frankfurt family (Bethmann), and each of the three almond halves adorning the cookies represents one of their sons. 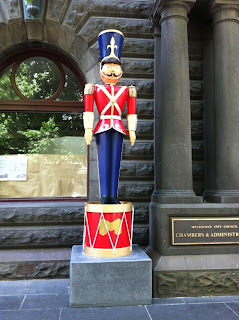 Most of the recipes I have subsequently found for Bethmannchen contain marzipan. However, I found my recipe in German Baking Today by Dr Oetker. The genius of this recipe is that is does not contain marzipan - perfect if you want to make Bethmannchen and don't have any marzipan. They are also both easy and tasty. Sift the icing sugar into a bowl. Add the almond meal and cornflour and stir to combine. In another bowl, beat the egg white until stiff peaks form. Add the icing sugar mixture to the egg whites, and mix briefly with the mixer. Preheat your oven to 180 degrees Celsius. Brush each cookie with milk, and place the baking sheet in the centre of the oven to bake the cookies for approximately 15 minutes. Remove the cookies from the oven and allow to cool on a wire rack. These little cookies were my favourite item in the gift box - they were so tasty I was glad that I only had enough cookies for me to eat one. This week's French Fridays with Dorie recipe is Cheez-it-ish Crackers. These are cheese biscuits with a kick of cayenne pepper. They are easy to make, and delicious to eat - a perfect combination. As Dorie says, they would be the perfect accompaniment to a cheese platter. To see what the other Dorie cooks thought of this recipe, visit the LYL section of the FFwD website. Last Sunday was Vlad's birthday, and in true work celebration fashion, I baked him a cake. Vlad is a cheesecake fiend, so the cake of choice was cheesecake. I decided to go off the beaten track a little with this cheesecake. I didn't have any cream, so I had to choose a cheesecake without cream. I turned to the Australian Womens Weekly Bake cookbook, and found a plain baked cheesecake made without cream called the Bistro Cheesecake. Perfect! I used chocolate ripple biscuits for the base instead of plain biscuits, exchanged the lemon zest for a cup of chocolate chips (which all sank to the bottom - oh well) and 2 tablespoons of Kahlua, and decorated the top of the cheesecake with ganache (after acquiring some cream! ), white chocolate stripes and a fondant disc. But you get the idea. The cheesecake worked, and it tasted pretty good. Place biscuits in a food processor and process to form fine crumbs. Add the melted butter, and process until combined. Press the mixture over the base and sides of a greased 20cm springform pan. Chill the base in the fridge while you make the filling. Beat in the 2 tablespoons of Kahlua and fold in the chocolate chips. The mixture is liquid, so yes, the chocolate chips will sink straight to the bottom of the mixture. Pour the cheesecake filling into the chilled biscuit base, and bake the cheesecake for 50 minutes until set and only slightly jiggly on top. (Mine took around 20 minutes longer.) Cool the cheesecake in the oven with the door ajar. Refrigerate for 3 hours or overnight. I ended up with a small crack in the top of my cheesecake, and wanted to hide it, hence I made the ganache using 75g of dark chocolate and 50ml cream. Chop the chocolate finely and place it into a heat proof bowl. Boil the cream, then pour it over the chopped chocolate, and let the mixture sit for around 3 minutes before stirring until smooth. It will be quite a thick ganache, so spread it over the top of the cooled cheesecake. Pipe melted white chocolate in stripes over the top of the ganache. My plan was to feather it, but it set too soon. Oh well. Make a name disc out of rolled fondant and pipe a name in chocolate on top. Glue the disc to the cheesecake with a dab of melted chocolate. For the last Wednesday with Donna Hay this year, I have chosen Chicken and Pumpkin Risotto from p130 of Modern Classics I. You can also find it online here. I left out the parsley but otherwise made the recipe as stated. It is much easier than risotto usually is to make because this is a baked risotto, so you can set and forget. I adore pumpkin and chicken, so this flavour combination suited me perfectly. 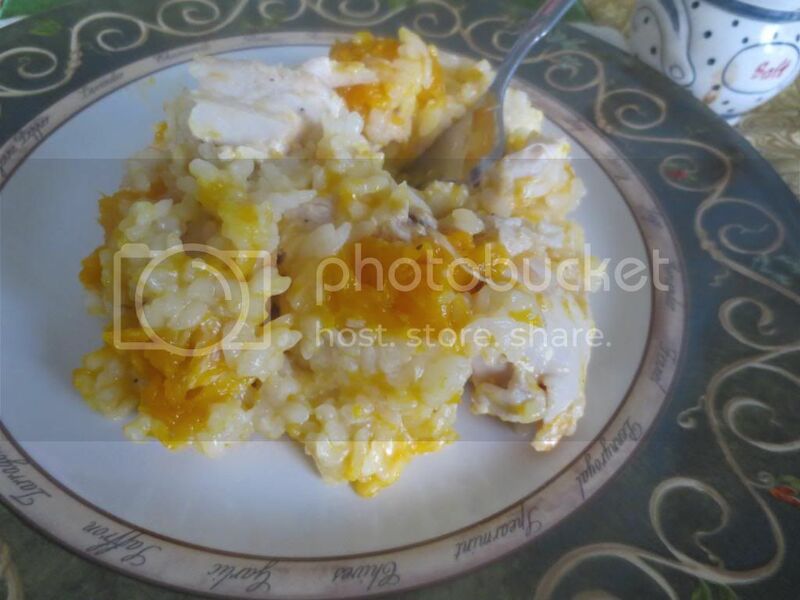 To see what Margaret and Chaya thought of this risotto, visit their blogs on Wednesday, US time. Hopefully, Wednesdays with Donna Hay will resume in the New Year. This week's Baking with Julia recipe was bread - Finnish Pulla, to be exact. This bread is on the sweet side of the spectrum, being decorated with sugar and almonds, and flavoured with cardamom. Our host was Erin of The Daily Morsel. My heart sank a little at this choice, because bread is never an instant gratification baked good. Yeast needs time to do its work, and at this time of the year, time is at a premium. I also found the thought of making a braided bread a little daunting - in the end, I had to go in front of a mirror and braid my own hair before I could translate it to the strands of bread dough. Another catch is that I have a tiny kitchen with minimal bench space, and each of the bread strands had to be 36" long - definitely a challenge in a small kitchen. However, after a false start with the braiding, I managed to make it work. And boy, I am a glad I did - the end result is rather impressive looking, as well as rather massive, and tastes really good - crusty on the outside, fluffy in the middle, perfect with just a slather of margarine. To see how the other BWJ bakers went with Finnish Pulla, visit the LYL section of the website. Don't you love Christmas baking? Every year there are new possibilities, and the difficulty lies in choosing what recipes will make the final cut for the year. I am going to start a series of Christmas box posts with a super easy gift that I made for my friend Craig, who cannot eat dairy or gluten. This year, I chose to make him Cherry-Topped Coconut Macaroons that I made using this recipe that I found online. If you can stir things in a bowl and scoop things with a spoon, you can make these macaroons. You just need dessicated coconut, egg whites, sugar and vanilla extract, and glace cherries for the top (which is optional). I wanted the cherries on top because they make the macaroons look so festive with their red and white colours. I tried the finished product and is is delicious, although rather on the sweet side. These biscuits would make a great project for the kids these holidays, and I am sure would be appreciated by the recipient (provided they don't hate coconut!). 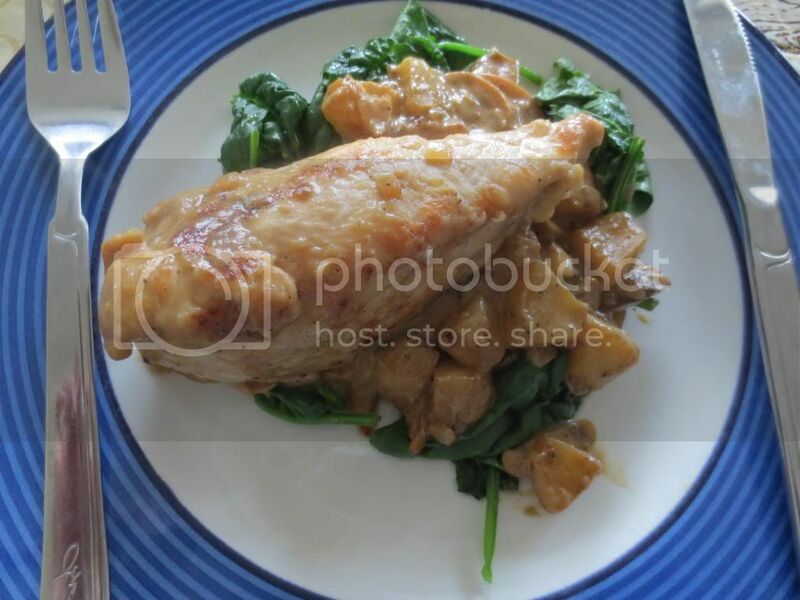 This week's French Friday with Dorie recipe is a special treat - it is chicken, apples and cream a la Normande, and is one of the most delicious chicken dishes I have ever tasted. Yes, I gush - however, you know that I am just as ready to tell you if I don't like a recipe, so take this as an honest to goodness, although subjective, review. This dish features pan fried chicken in a cream sauce dotted with apples and mushrooms. If you would like to replicate this deliciousness, you can find the recipe online here. The only changes that I made were to use light cream instead of heavy cream and use a brown onion rather than a yellow one (I have never seen a yellow onion! ), and my choice of alcohol was brandy (as that is what I had in the house). As per Dorie's serving suggestion, I served my chicken with Dorie's lemon steamed spinach, which cut nicely through the creaminess of the sauce. I have never been to Normandy, but boy, I like the way they cook chicken. To see whether the other Dorie cooks agree, visit the LYL section of the FFwD website. This week's Wednesday with Donna Hay recipe is Fettucine Carbonara, chosen by Margaret, from Modern Classics I. You can also find the recipe online here. 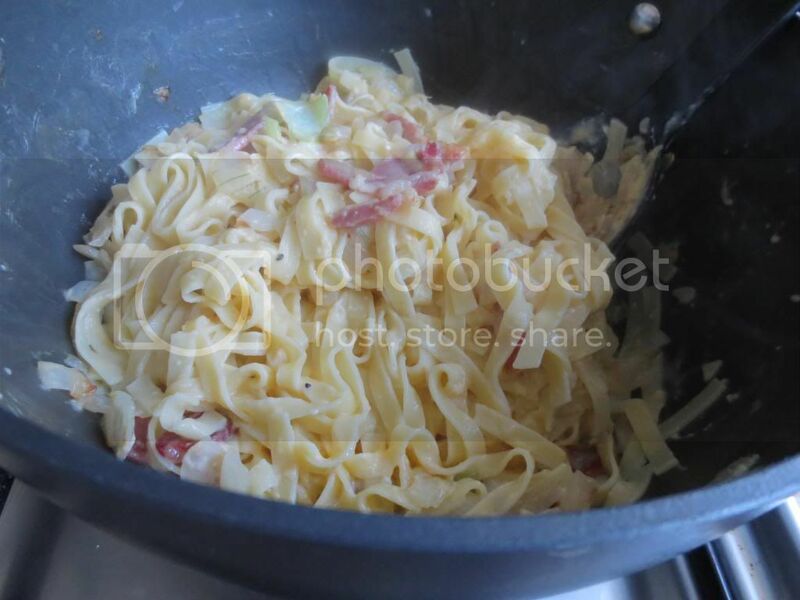 The recipe is for a quick, easy, traditional creamy pasta with eggs, bacon and cheese in the sauce. I prefer tomato-based sauces, but this was pretty good, especially when paired with fresh vegetables to add some balance to the equation. To see what Margaret and Chaya thought of this recipe, please visit their blogs on Wednesday, US time (~ 1 day behind me). Last Saturday, it was my boss's birthday, so I made him a birthday cake. I knew his favourite flavour was chocolate, so of course, I made a chocolate cake. The hardest decision was - which recipe should I use? Fortunately, not long before, Felicity Cloake had published a recipe for the Perfect Chocolate Cake in The Guardian. I figured this was the one. 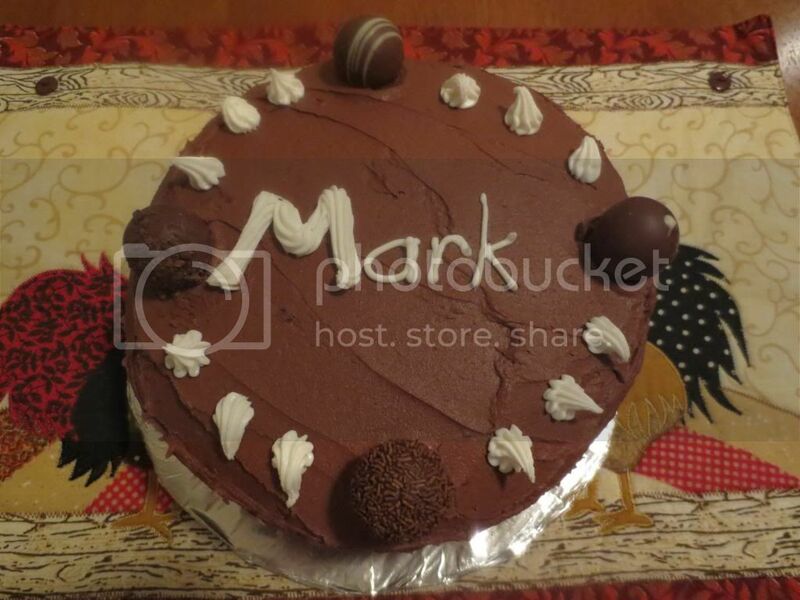 However, instead of decorating my cake with Oreo crumbs, I decorated it with chocolates and piped icing. I have to say that this cake was really good - moist, chocolatey and not too dense, yet rich enough to be decadent. Perhaps Felicity was right when she claimed this to be the "perfect" chocolate cake. This week's French Friday with Dorie challenge made my heart sink. Soup? Cauliflower soup? This did not sound promising on either count. And unfortunately, making it did not change my mind. 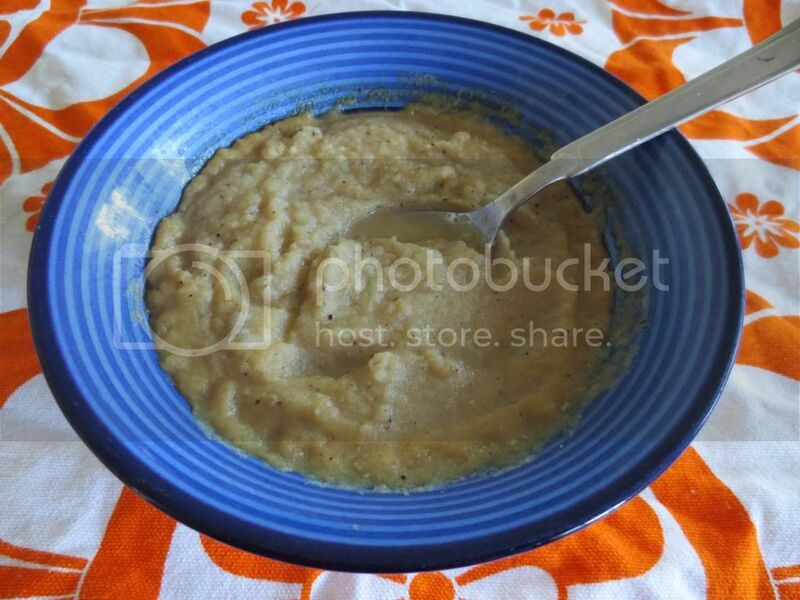 I looked at someone else's photo of this soup and noticed that it was (a) off white and (b) liquid. My soup looks like mashed apple. And it tasted, sadly, like mashed cauliflower. You can see where this is heading, right - I am not a fan. Soup is not one of my favourite things unless it is Campbells or Heinz Chunky out of a tin, and this soup did not change my mind. Sorry. Today we held an afternoon tea at work in honour of Janet, who finishes up this week to have a baby. Linda made a beautiful nappy cake for Janet as a gift from all of Janet's colleagues, and there was terrific catering from Junto Cafe. And of course, I baked. My contribution to our feast was Donna Hay's Beehive Cupcakes, with honey buttercream icing instead of meringue icing because I did not want to feed uncooked eggs to a pregnant lady. My beehives look a little flat, primarily because it was a warm night and there was no time for me to set my buttercream before piping it onto the cakes. I don't think anyone, least of all me, cared about that. 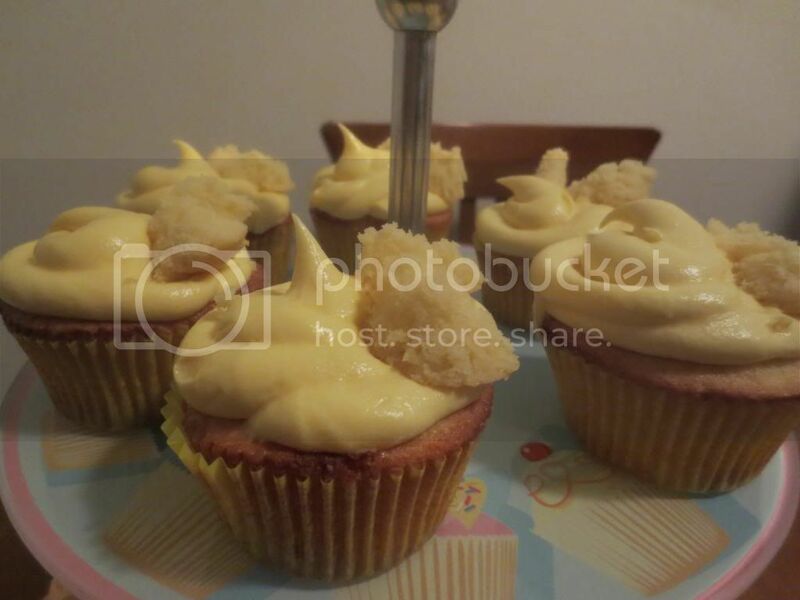 The resulting honey flavoured cupcakes with honey icing were devine. There was not so much honey as to make the cakes sickeningly sweet - the honey just added a pleasant sweetness and no more. You can find the recipe for the cakes here on Donna Hay's website. And you can find the recipe for the honey buttercream here. This week's Wednesday with Donna Hay recipe was chosen by Chaya. She selected Potato Rosti from p70 Modern Classics I. The recipe involves cutting four potatoes into strips using a potato peeeler, then mixing them with oil, salt and pepper, parmesan cheese and thyme, and piling them into six mounds before baking them in the oven for around 2 minutes. These baked potato morsels are undoubtedly tasty, either hot or cold (I have tried them both ways!). The fact that they are baked rather than fried also makes them slightly healthier than your average rosti. However, unless you use a food processor to make the potato strips, it is long hard labour using a potato peeler to create the potato strips for the rosti. It tok me the best part of half an hour to make those strips, and I belatedly lamented not using the food processor. 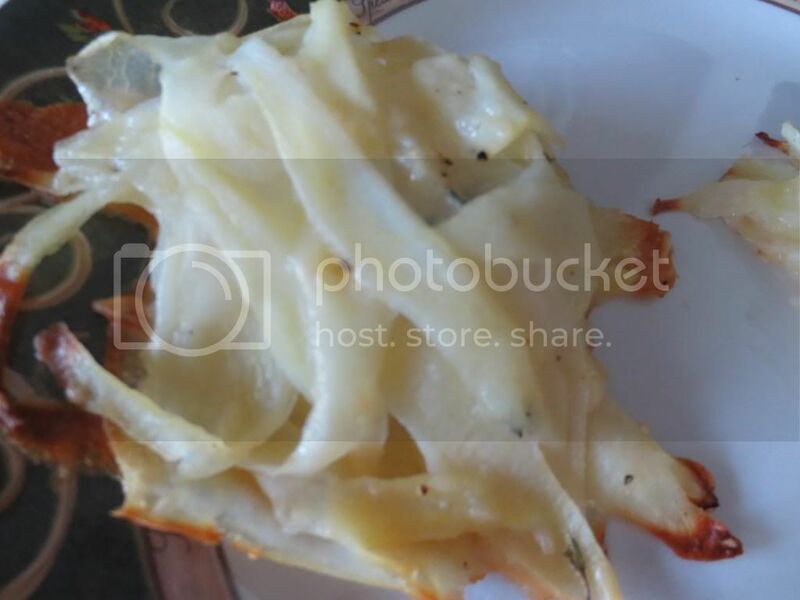 To see what Chaya and Margaret thought of these potato rosti, visit their blogs. This week's Baking with Julia recipe, hosted by Karen of Karen's Kitchen Stories, is Gingerbread Baby Cakes. Now until this recipe cropped up, I had never heard of "baby cakes" before. Apparently they are little cakes about 4" in diameter, not mini muffins as I first thought. No baby cake tins - no worries. I made two x 9" cakes, one of which I froze for later. I substituted golden syrup for molasses (it used up an entire bottle! ), and subbed much of the brown sugar for white sugar as I had run out of brown. 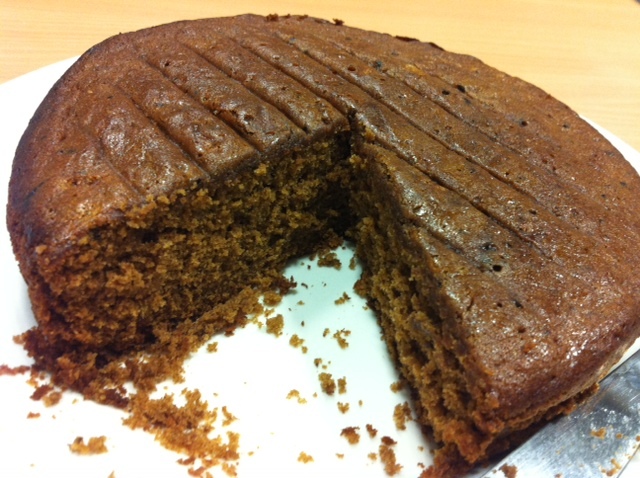 I don't see that it made much difference in the end - I ended up with a very full bodied gingerbread cake that was moist and flavoursome. That fresh ginger added quite a bit of kick! 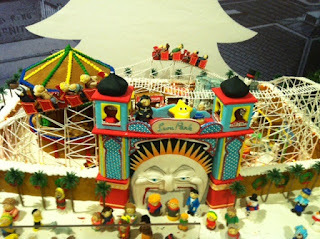 If I was hankering for gingerbread, I'd make this again - it was good. I think it would be terrific iced with a lemon glaze. A couple of weeks ago, I went to Sydney with my colleague, Lee, for work, and we stayed for the weekend to play. 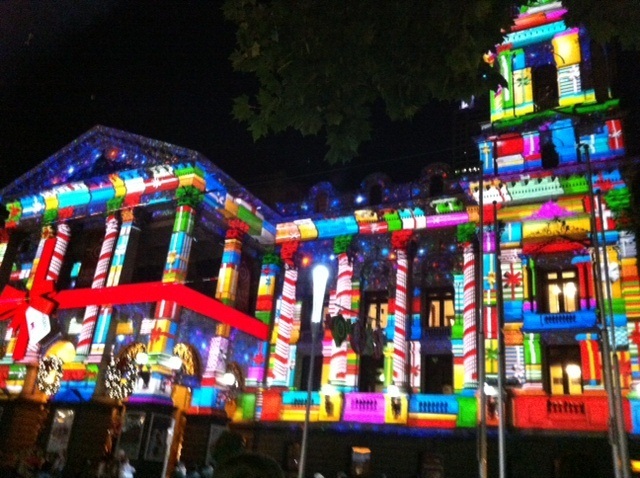 It was a great opportunity to sample some of the fabulous eateries that Sydney has to offer. On our first night, we went to Bills in Surrey Hills. For the uninitiated, "Bill" is Australian chef Bill Granger, who now resides in London. Being a Wednesday night, Bills was quieter than it would be on a weekend, hence we were able to get a table immediately on walking in off the street. For main, I ordered the yellow fish curry with brown rice and cucumber relish, pictured at the top of this post ($28). This is a fairly mild curry, but still very tasty, and the brown rice was perfect for soaking up the sauce. What can I say - this was a delicious pav, Aussie style, crispy on the outside and soft in the middle, with a brown sugar twist ($14.50). which is light and airy and spacious. The front part of the warehouse space is the cafe itself, while the back part of the warehouse is a homewares and garden shop. You can buy cheeses, jams, jellies and sauces in the cafe area. On Thursday night we went to a cocktail party at the Penthouse in The Ivy in George Street. What goes on tour stays on tour, but I can say that we ended the evening at Hungry Jacks in George Street where Lee conversed with the locals about Aussie Rules football and the meaning of life. Lee partied on into the wee small hours, so I was glad that I left with another colleague at a more moderate hour. Frankly I do not have the stamina to stay out all night, and having never done it as a much younger person, I am not about to start now. The flavours are, left to right: burnt vanilla, salt and vinegar, vanilla milkshake, carrot cake, salted caramel and salted butter popcorn. The stand out was the salted caramel macaron, with a flowing caramel centre. My second favourite was the carrot cake macaron, which indeed tasted like carrot cake. The vanilla milkshake had a very milk-like slipperiness to the centre that I wasn't that keen on, and the salt and vinegar indeed tasted just like salt and vinegar, but it seemed odd in a macaron. It unfortunately got a little beaten up before I photographed it, but it looked gorgeous and tasted devine. I also bought one of his famous chocolate mousse cakes from Masterchef ($9), but it paled into insignificance in comparison with the sweet decadence of the V8 cake. I was surprised to see that the Balmain branch of Adriano Zumbos had substantially wound down since I last visited. On my first visit a couple of years ago, I had to wait in line for an hour to get in, and the shop was heaving with baked goods. This time, I walked straight in off the street and the range of baked goods was much reduced, with quite a bit of blank space. Maybe now that there are a number of branches of Zumbos throughout Sydney, many with facilities for eating in, the original "hole in the wall" shop is not as popular. Laduree's macarons are rather more expensive that the Zumbarons. While I believe that the presentation and condition of the macarons was superior to the Zumbarons, for flavour, I believe the Zumbarons pack a much bigger punch. The Laduree flavours that I chose are (left to right, top row then bottom) raspberry, violet marshmallow, San Domingo chocolate, pistachio, salted caramel and blackcurrant. Of these, I preferred the blackcurrant for its punchy flavour. I was also lucky enough to try a licorice maracron, as they were on the counter for tasting, and the friendly gent who served me specifically offered me one. The licorice was rather good too. It was delightful, especially the scallops (which I am terrible at cooking myself). For side dishes, we ordered the butterhead lettuce with gorgonzola, grapes and hazelnuts and the potato fries to share. Both were complimentary to our fish dishes. Unfortunately, the name of the cafe eludes me, but this trifle was very good and the service was friendly and efficient. Lee and I then went to the Francis Bacon Exhibition at the Art Gallery of New South Wales. My favourite part of the exhibition was the various photos that Bacon used of his friends and acquaintances as inspiration for his paintings by tearing and folding the photos to distort the bodies. I love looking at faces, and these were faces from the swinging 60s in London, hence making them even more interesting to me. Sadly, all good things must come to an end and we headed back home on Sunday afternoon. However, it was a wonderful weekend, and a perfect way to round out the year. Yesterday, I attended another cupcake decorating class, this time at CW Cakes in Malvern. I had no expectations as to what this class would be like, as I bought the class through a voucher site that didn't describe the class. 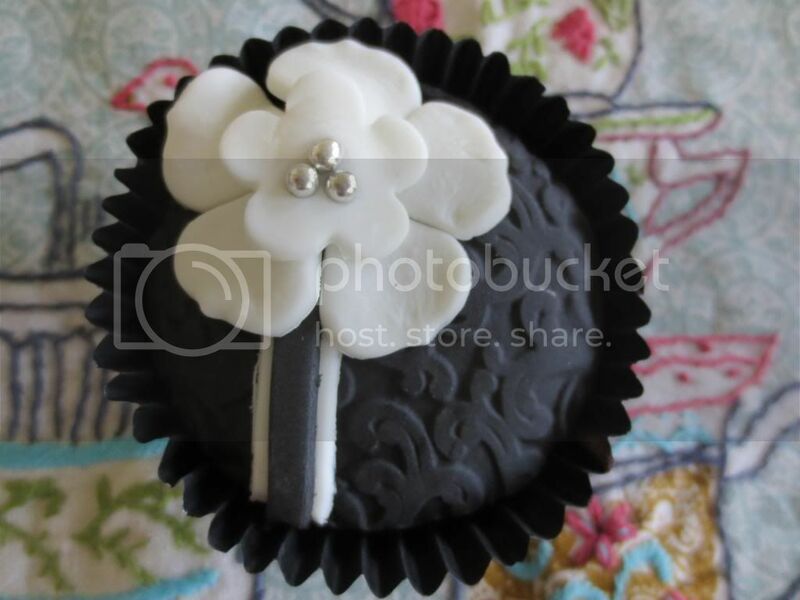 Our friendly instructor, Ella, introduced the 2 hour class as the Black and White Cupcakes course, and our decorating medium was to be black and white fondant. Although I had already done a fondant decorating class this year, the CW Cake course was different again, and I learned some new techniques - namely, stencilling and the use of moulds. 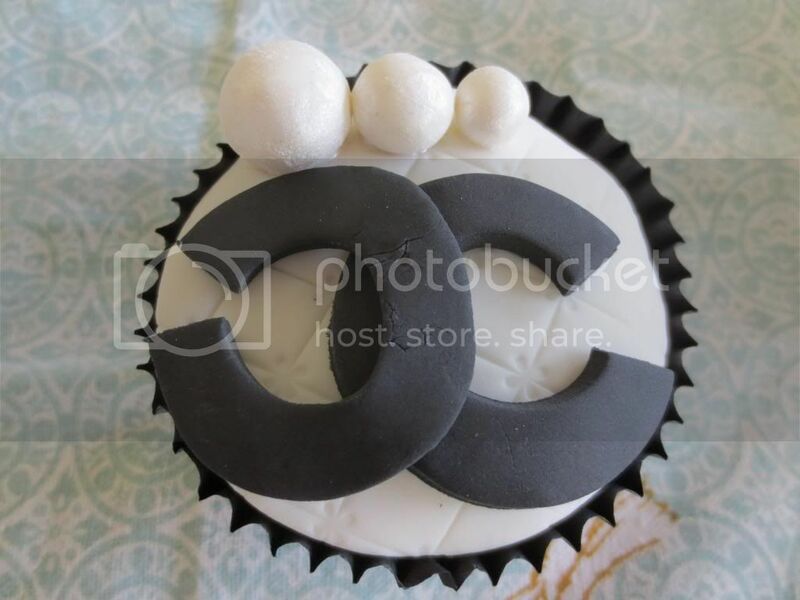 This was made by simply imprinting the fondant with an upholstery type design, cutting out the disc, then attaching two black fondant "C"s in a mock-up of the Chanel logo and attaching three little lustre dusted fondant balls of various sizes. The disc was attached to the top of the cake using sugar glue, and the decorations were then attached to the top of the cake in the same way. 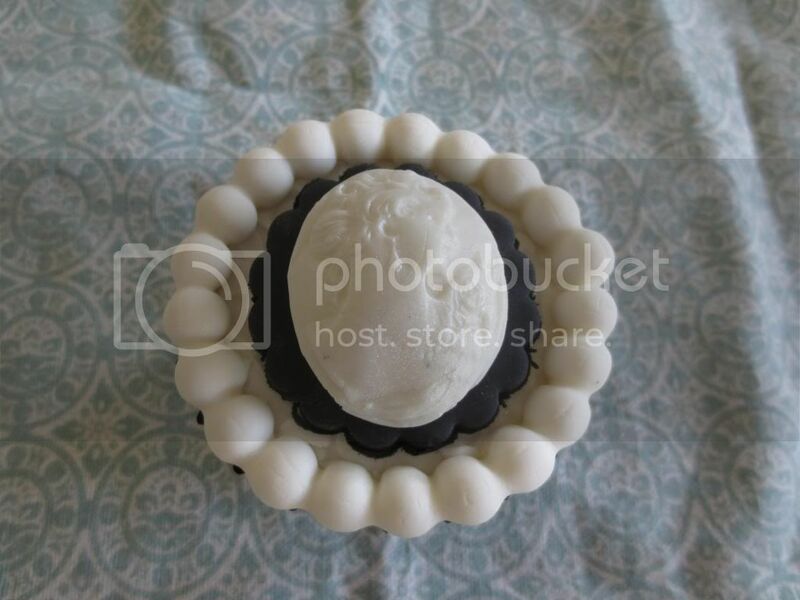 This involved placing an imprinted disc of fondant on the top of the cake, lustre-dusting it using a large make-up style brush, adding a scalloped black fondant circle, and making a cameo brooch by pressing fondant into a silicone mould, popping it out then lustre dusting it before attaching it to the top of the cake. The pearls around the edge of the cake were made by pushing a rolled sausage of fondant into a pearl mould, then using a knife to cut off the excess. This was my least favourite design because I think it looks kind of clunky, and there is no way that I would personally want to eat that much fondant. 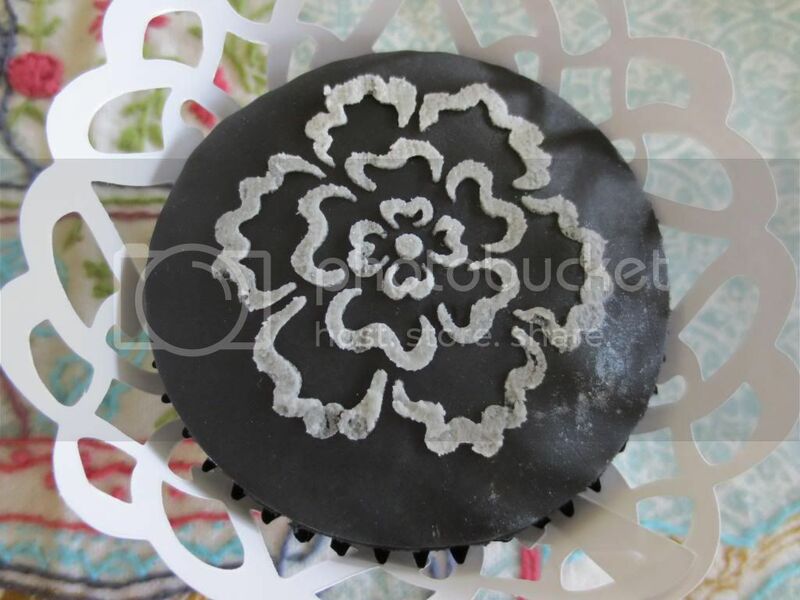 This was made by rolling out the fondant to 2.5-5mm thick, pressing a stencil firmly onto the top of the fondant, covering the stencil with very thick black royal icing, scraping off the excess with a plastic spatula, then carefully lifting up the stencil. Once again, everything was attached using sugar glue. I also filled this cake using white buttercream piped into the cake using a Wilton 230 piping tip. 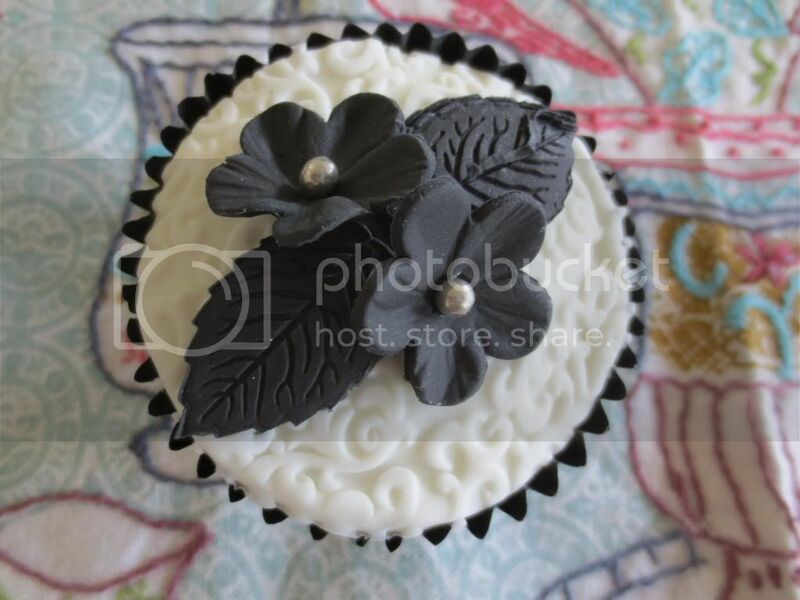 This involved an imprinted fondant disc, to which was attached two fondant leaves made using a plunger cutter and two fondant flowers which were pressed into a hibiscus mould to give them a more life-like appearance, with silver cachous attached to form the centres. My other cupcake classes this year were at Whimsical Cakehouse (fondant) and Crabapple Bakery (buttercream). I think that the most elegant cupcakes are achieved using fondant, although the buttercream ones are tastier. I liked a number of designs from both Whimsical and CW Cakes, but the cake preparation taught at Whimsical, by cutting and ganaching the cake before decorating, gives a superior end product, although time consuming to do. I like that the techniques taught aat the fondant classes are very easy to replicate at home, and I already own a number of the tools required. 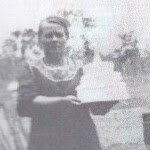 Other tools, such as the ribbon cutter, are not necessary, as the same result can be easily achieved with a knife, and good old fashioned water or sugar syrup works just as well as sugar glue. If I am ever called upon to make special occasion cupcakes, I know I have learned enough decorating techniques to make some elegant yet simple cakes. Last night, to top off a very food orientated day, I went to see Margaret Fulton - Queen of the Dessert (A Musical) at Theatreworks in St Kilda. It was lots of fun - I had no idea what to expect, but in the end loved it. Being a Margaret Fulton fan made the experience even more special - my first cookbook was the Margaret Fulton Cookbook. The performance also offered a chance for some celebrity spotting, as Eddie Perfect from Offspring, among other achievements, was in the audience.